Recykerbag® Green Waste Sacks mean higher quality garden waste and no wheeled bins to hide heavy soil, stones & non organic matter. 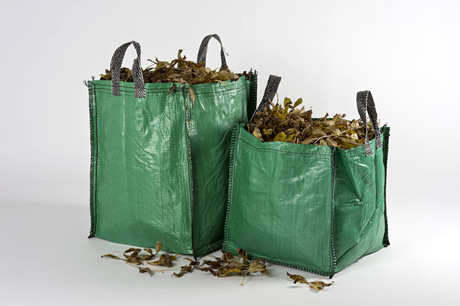 Our Garden Waste Sacks are tough, breathable, UV resistant, Woven Polypropylene bags with high abrasion resistance. Made in the UK or imported to your requirements – long lasting durable quality and made to a size that suits your application and printed with your details and user instructions. We can even supply them with rubber Anchor Pads in the base so they stay put when empty. Our Garden Waste Sacks are made from virgin grade material which is why they last so long. They are 100% Polypropylene & 100% recyclable. Here at Sack Maker our garden waste sacks are manufactured from the highest quality UV stable polypropylene. Our garden waste bags are durable and long lasting and can be made in a variety of sizes and options making our green waste bags the ideal choice for all local authorities, gardening and landscaping companies.